I think it's kind of funny how I was inspired to create this meme. The idea came to me a couple weeks after visiting a high school and seeing a poster on the walls that said, "I'm so glad I didn't get a yearbook. Said no one ever." I thought it was clever and obviously it stuck with me until out of the blue, I thought of how to apply it to my favorite bird. Who'd think that a trip to a high school would help create a bird meme? Anyway, I hope you enjoy it! You thought you had it bad with your kids, just be glad you're not this American Goldfinch dad, hounded by a couple young ones until he just had to leave the branch! Sorry for the quality of the images. I just thought that the behavior was just too good to not share! As if to brighten my spirits on an unseasonably cold and wet early June day, two female Ruby-throated Hummingbirds recently provided me with two very special treats. 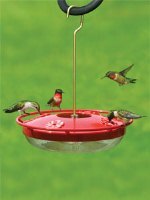 Hummingbirds in our area do not typically share a feeder. Male and female both guard nectar feeders and swoop in to drive off any intruders. But in the cold and rain these two females decided to conserve their energy and focus on the business of eating. I enjoyed seeing them share feeders throughout the day. And I enjoyed seeing this female use my hummingbird swing which is strategically placed to allow her to watch over 4 different hummingbird feeders. Seeing these less-than-common behaviors sure warmed my heart on an otherwise miserable June day. Now that Purple Finches are mostly done with the breeding process, except for a few begging fledglings out there, they can turn their attention to the next high-energy-demand process in a bird's life: MOLTING. We're having a very good Purple Finch summer, so we have a big bunch of raspy-lookin' birds filling our feeders. Here, take a look! While we were recently in Nashville TN, we had one day to take in a little nature. We spent some time on the trails at Shelby Bottoms Park, a 960-acre park just south of downtown Nashville. The park has a nice variety of habitat, from riverfront and pond, to field and hardwood forest. We accumulated 30 different birds during our walk there, including a really good show put on by a Killdeer. We encountered this Killdeer in a large field, calling loudly and showing a variety of defensive displays. Perhaps the path took us too near the nest, which is often not much more than just a little scrape in the ground. Killdeer are known for their broken-wing display, acted out away from the nest to draw our attention away. What an attractive bird they are, with their suit of brown, white and black. What big eyes they have too, ringed with a bright red eye ring. We moved on fairly quickly to let them get back to their nest, at least until the next park visitor came along the winding path through its home field. FAQ - Can Cedar Waxwings Get Drunk Eating Berries? Q. Is it true that Cedar Waxwings can actually get drunk eating fermented berries? Cedar Waxwings can survive almost entirely eating fruit and berries. But if they eat berries that have overripened they can indeed become drunk, or even die. Overripe berries can ferment and produce alcohol, which brings on this result.